11/18/2014 This condo has now been sold! Contact me if I can help you find your waterfront condo! Lakeside cottages just don’t get any cuter than this! Tiger Cat Flowage is a 1065 acre body of water comprised of several connected lakes, just east of Hayward. 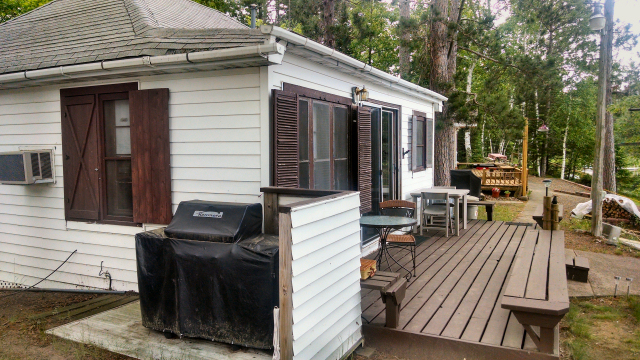 This cabin is on the east shores of Lower Twin Lake, about in the center of this flowage. This lake provides excellent boating and fishing opportunities. 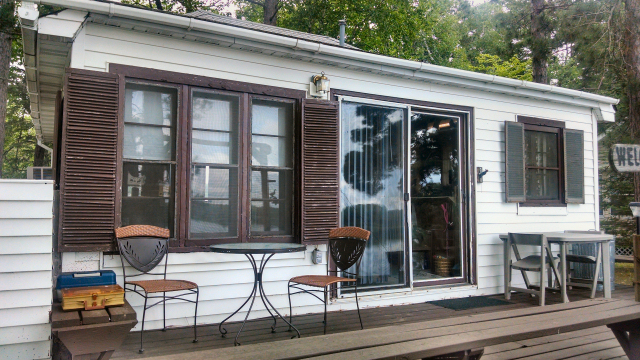 This cottage at 11481 N Kateri Lane is truly lakeside- the large deck overlooks the lake and you are only a few steps down to the shoreline. 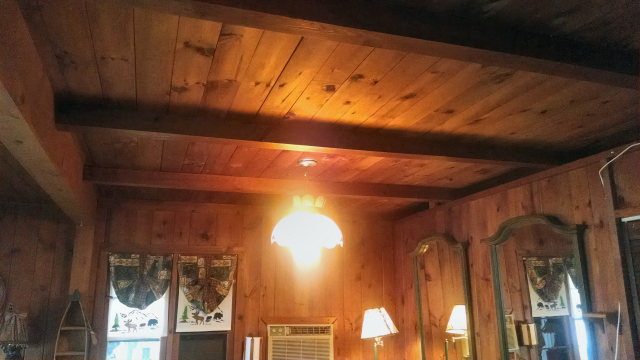 This cabin is one of six condos, all of which were once used as a retreat for an order of priests, from what the seller told me. This condo association is very loosely knit – the seller tells me they don’t pay set condo fees, but rather each owner pays his/her share of the common element insurance and perhaps a small fee to re-gravel the common driveway each year, and these costs have never been above $100 per year. Each owner takes care of their own limited common elements (your yard area) and there isn’t much to do – perhaps a little spring clean up is all I could see. 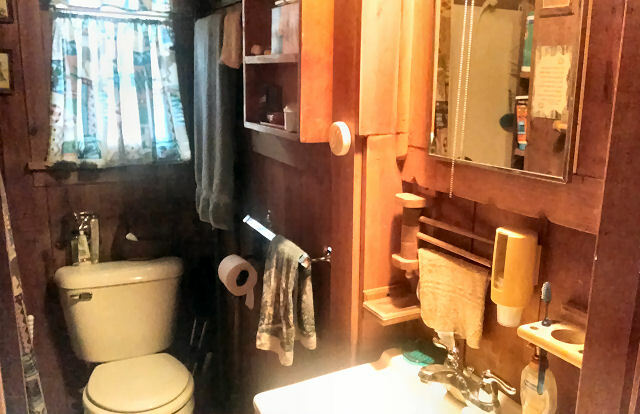 The cottage is very tidy and ready to move into – the sellers have made improvements over the years they’ve owned it, including a newer roof, siding, septic holding tank, flooring and more. The inside is traditional wood and nicely done with many unique built-ins for storage. This is a three season cabin that is normally shut down over winter, but you do have a portable propane fireplace to warm you up on those chilly Wisconsin fall evenings. 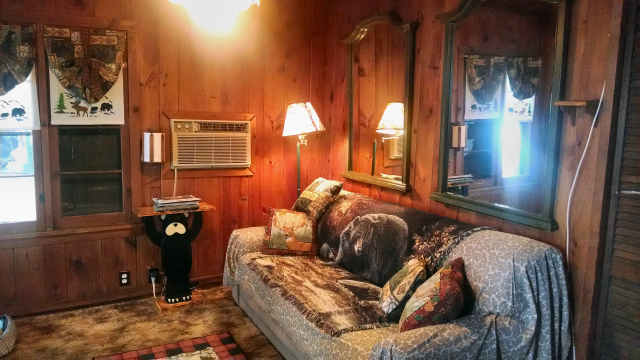 Two bedrooms are at the rear of the cabin and each has plenty of storage build in. The bathroom, even though it is small, is efficiently designed and has a stand up shower. 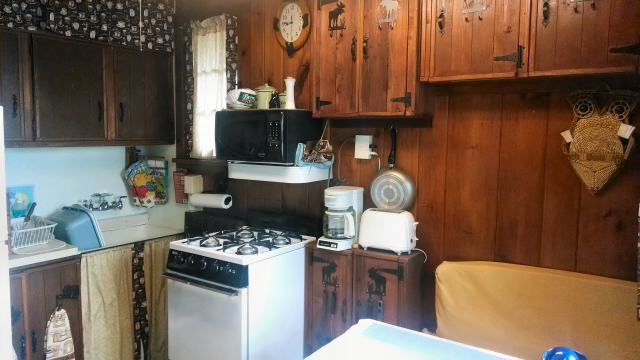 The kitchen has a nice lakeview breakfast nook along with a refrigerator, stove and microwave. The wood cabinets are decorated with metal ‘up-north’ cutouts, and other northwoods touches that really make the place feel ‘homey’. The livingroom is graced with a wall of lakeside windows plus sliding patio doors for a wonderful lake view. You can enjoy the beautiful sunset from both inside your cabin or on the deck. Your spacious deck has built-in seating plus room for more furniture. The grill is even included! All furniture and furnishings come with this cottage so you don’t need anything to begin enjoying it. You will need to buy a new dock since one doesn’t come with. The exterior has been sided with vinyl siding, including the soffits and eves so you are pretty much maintenance free! All has been well-taken care of over the years. 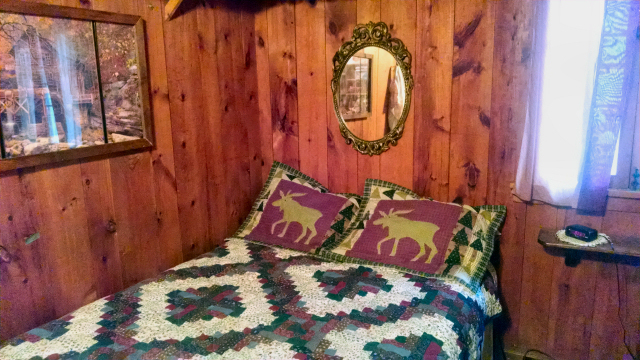 You have two parking spots behind the cabin plus a newer shed for storage. 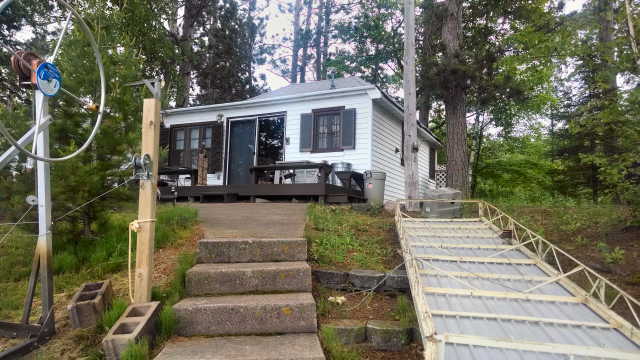 All-in-all, this cottage is an excellent low-cost way to get on this wonderful lake. Contact me today to set up your personal tour! This entry was posted in Cabins For Sale Hayward, Condos For Sale Hayward, FEATURED PROPERTIES, waterfront cabins, waterfront condos and tagged cathy lareau realtor, cheap cabin for sale hayward, condo cabin for sale hayward, fishing cabin for sale hayward wi, lake cottage for sale hayward wi, lower twin cabin for sale hayward wi, muskie fishing lake cabin for sale, northwest wi cabin for sale, tiger cat cottage for sale hayward, tiger cat flowage for sale, waterfront cottage for sale hayward wi. Bookmark the permalink.